Just had to share this recipe because it blew my mind.....I had NO IDEA how easy it was to make your very own vanilla extract! Granted it isn't a last minute type of thing and takes quite a bit of time to 'mature,' but having an endless supply of this vanilla extract (aka liquid gold in this household) is too tempting. A bottle of this plus a batch of homemade honey lavender cookies, and I'm am good to go. 2. 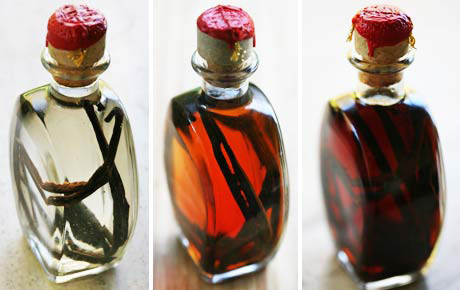 Put vanilla beans in a glass jar or bottle with a tight fitting lid (mason jars work well). Cover completely with the vodka. 3. Give the bottle a good shake every once in a while. Store in a dark, cool place for 2 months or longer. You can also make vanilla sugar by putting a split vanilla bean into a jar of white, granulated sugar. Great way to infuse the sugar with vanilla flavor for baking. whhhhaaaaatttt??? ?it's that easy??? ?I could use vanilla extraxt behind my ears!! !thanks for the post. I am loving this recipe and the little jars they come in!! New follower ....your site is so cute! !